follow site Fermentation is an age old practice that has been utilized by humans for thousands of years. It is a way to store food without refrigeration, make food more easily digestible, is rich in beneficial bacteria, and is more nourishing for the body. Most fermented foods that we are familiar with are created by the process of bacteria converting sugars that are present in food into lactic acid. Those bacteria, lactobacilli, impart a satisfying, distinctly sour tang, which you might recognize after eating true sourdough, or a bite of plain yogurt. This “good bacteria” can be very beneficial to both digestive and overall health. This transformation in the food increases the bioavailability of nutrients and prevents spoilage from occurring. When fermenting, the food doesn’t spoil because good bacteria changes the environment and creates an unsavory, acidic home for bad bacteria that can spoil food, and in turn, make us sick. Commonly known fermented foods that the majority of people in our country find appetizing are sourdough bread, cheese, chocolate, beer, wine, coffee, yogurt; all these go through a process of fermenting before they are enjoyed. All over the world there are many traditional delicacies and dishes that are fermented in the home, and these may seem strange (and indeed can be an acquired taste) but are no less delicious and good for you! In general, it is difficult to go wrong with fermenting, though sometimes I feel a bit of trepidation as well as the excitement to try something new. 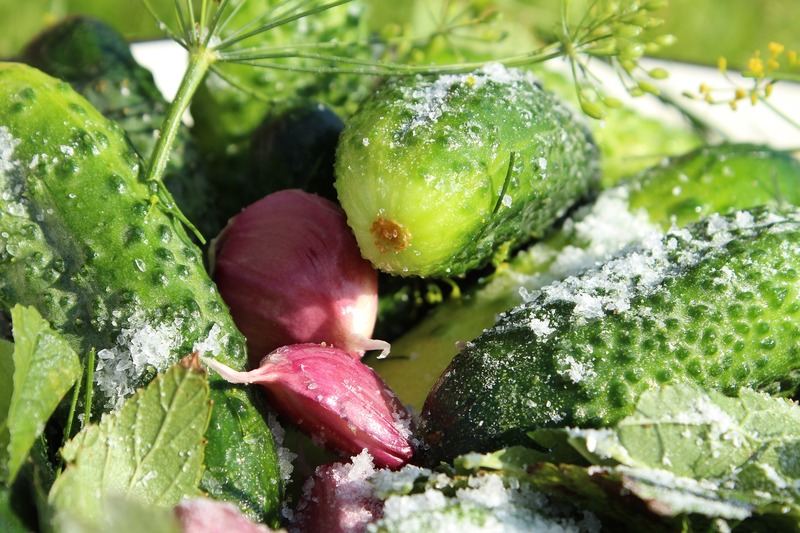 Fermented vegetables are one of the safest things to make, however when fermenting foods like meat, proper safety precautions and rules must be strictly followed. The process and microorganisms involved with fermenting meat are a lot more complicated, and the outcome can be potentially dangerous if done improperly. The equipment you need for most fermented foods is pretty basic, and likely you already have them available in your kitchen. One of the only things you need aside from the food ingredients is a vessel for storage. Usually a stoneware crock, or a glass container will work just fine, there are also plastic buckets specifically for fermentation. You’ll want to avoid metal as a storage container, due to the potential of the salt and acid from the food causing corrosion. Water is used for brines, and it is best to use water that is as free of chlorine as possible, since chlorine has the ability to kill or make the environment inhospitable for those beneficial microbes that you want in there. For best results, always use filtered or boiled water that is free of chlorination. In general while fermenting, the first bacteria that show up to the party are coliform bacteria. As the pH drops, leuconostoc bacteria take the helm, followed by lactobacillus as the pH drops even lower since lactobacillus thrives in a highly acidic environment that other bacteria cannot. They convert sugars and lactose into lactic acid, and those other starter bacteria can no longer survive, as well as other bad bacteria. The lactose into lactic acid conversion also makes it easier for people to digest milk based products, as the lactose is replaced. Thanks, lactobacilli! levitra senza ricetta Torino Sauerkraut is made by simply taking chopped cabbage, and pounding or mashing it (traditionally in a crock) with a small amount of added salt, and sometimes other additions for different flavor complexities. After pounding, the cabbage is pushed below the brine (the liquid created by mashing the cabbage and salt) and left to sit in a cool, dark place for several weeks. This results in a tangy, crunchy treat that can be enjoyed alone, or with many different foods. Here’s my favorite way to make sauerkraut! 5 lbs Cabbage, chopped into large or small pieces, whatever you prefer (be sure to set aside some of the large outer leaves, these can be utilized later to place on top to prevent some of the smaller pieces from rising above the brine in a crock). Put a couple handfuls of cabbage on the bottom of your crock, add a bit of garlic over the top, and then sprinkle with a little sea salt. Use a kraut pounder, masher, or use clean hands to mash and press hard on the cabbage, bruising and crushing it. The goal is to break down the cell walls and get as much liquid out of the cabbage as you can, as this becomes your protective brine. Continue layering the cabbage, garlic, and salt, smashing as you go, until all your ingredients are mashed up in your crock. Let it sit for 10-20 minutes and allow for the salt to work some osmosis magic and release more juices from the cabbage for the brine. If you still do not have enough brine after this, or notice the level of liquid getting too low during the process of fermenting, you can dissolve 1 tsp. salt to one cup of water, and add it directly to the top of your kraut as needed. Place the leftover whole cabbage leaves over the top of the mash, covering the top. Using a clean plate or crock stone weights, place on top of the cabbage, pressing down firmly until the brine covers the top of your cabbage, tucking the edges of the cabbage leaves to the side. Cover the crock with a lid that allows for air to escape, or secure a towel or several layers of cheesecloth to keep bugs and dust out. Place the crock in a cool, (optimally 65-72 ° F) dark location, and let it ferment for 1-4 weeks, depending on your taste. After a few days, if you peek into your crock you will see or hear it bubbling occasionally, releasing gases and a distinct sour “krauty” odor. The longer you let it sit, the more tangy and sour the flavor becomes. I usually let mine go for a month or longer to get the taste and texture I desire. Check the crock about once a week while fermenting, making sure that the brine stays over the kraut, (this is what protects it and keeps it fermenting properly), and take the opportunity to have a small nibble every week, so you can figure out the length of time to get the taste you prefer. If not using a crock, feel free to pack it into clean glass jars, and follow the same rules for aging. After you have fermented the kraut to your desired taste, it can be stored in the refrigerator almost indefinitely, as long as it is covered by the brine. Refrigeration significantly slows the fermentation process, allowing you to eat it at the optimal flavor. If there is any white “scum” on top of the brine, don’t worry, this is normal. Simply skim it off and discard it; your kraut is still safe to eat. Mold, however, is typically a sign that something has gone wrong, and you should play it safe and toss the batch. Eat your sauerkraut with meat or meat substitutes, eat it in soup, mix it into your mashed potatoes (thanks for that delicious tip, Grandma!) or just eat it by the spoonful. Try different additions! Apples are a traditional addition, and can make the kraut taste a bit sweeter. You can also add other veggies, such as carrots, onions, or even herbs. If you follow the basic rules and keep your equipment clean, it is hard to go wrong with sauerkraut! Enjoy your food, try new things, and keep on fermenting!